The war in the north Caucasus has its origins in a 200-year old struggle of Chechen people to shake off Russian rule. - A mountainous region in the Caucasus range, Chechnya is inhabited by a mainly Muslim population with a fiercely independent spirit. - The conflict with Russia dates back to the late 18th century when Shaikh Mansur led a struggle against Tsarist rule. - Josef Stalin, fearing Chechens would be disloyal during the Second World War, deported the entire nation in 1944 to Central Asia where thousands perished. Soviet leader Nikita Khrushchev let them return in 1957. - After Dzhokhar Dudayev declared independence at the end of Soviet rule, President Boris Yeltsin sent in troops in December 1994 and Russia became mired in war. Stiff rebel resistance led to a truce being signed and Moscow withdrew its forces. 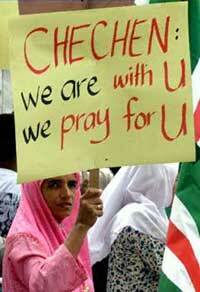 - During three years of de facto independence, Chechnya was gripped by lawlessness. After some former rebels took the independence struggle to neighboring Dagestan in 1999 and Vladimir Putin, then prime minister, blamed rebels for bombings in Russian cities, troops were sent back to Chechnya and separatist leaders fled. - Putin, as president, started establishing local rule, appointing Akhmad Kadyrov head of a loyalist administration in 2000. Kadyrov was killed in a May 2004 bomb attack at a Grozny stadium, which Moscow blamed on Chechen separatists. - Separatists have staged daily attacks on Russian troops. In the most daring raid in October 2002, rebels seized a Moscow theatre - 41 separatists and 129 civilians died, most from noxious gas used by Russian forces staging a rescue. - The conflict is complicated by the presence of oil in Chechnya and its strategic location as a gateway to the Caspian, which lies to the region's east. Akhmad Kadyrov - Kadyrov, among at least six killed in the May bombing, was a former clergyman who fought on the rebel side in the first 1994-1996 war. He later made peace with the Kremlin and was appointed by Putin in 2000 as head of a pro-Moscow local administration. chief of staff. He won a 1997 election, recognized by Moscow, to become president of a de facto independent Chechnya, but struggled to establish his authority. He has been in hiding since Russian troops retook the capital Grozny in 2000. Shamil Basayev - The most feared separatist commander, Basayev led the 1999 incursion into Dagestan, cited as grounds for the second war, and is said to have lost a foot after escaping.